We hope the answers below address any questions you may have about Purina for Professionals™. If you still have questions, please email us. What is the Purina for Professionals program? 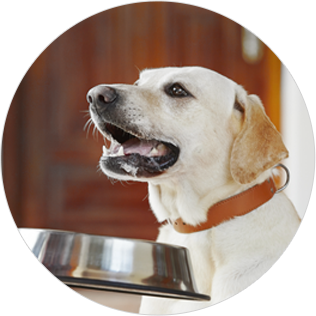 Purina for Professionals (P4P) is an online feeding program for veterinary professionals. 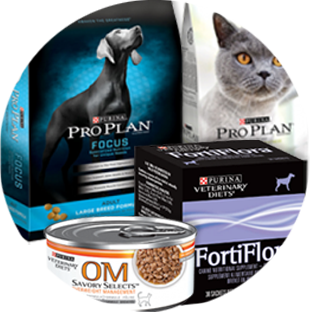 P4P offers professional pricing and home delivery for Purina Veterinary Diets®, FortiFlora® probiotic supplement, and select Purina® Pro Plan® formulas. Is the program restricted to certain veterinary professionals? All current staff members of your veterinary clinic are encouraged to participate in the P4P program. Can my clinic participate in Purina for Professionals if we don’t currently carry Purina products? Yes! All veterinary clinics are eligible to enroll in P4P. Please visit our online application to enroll in the program, or contact one of our customer service representatives. What products are available through the Purina for Professionals program? Purina Veterinary Diets®, FortiFlora® probiotic supplement, and select Purina® Pro Plan® formulas. Each person participating in the program uses their own method of payment. All American Express, Master Card and Visa credit/debit cards are accepted. How do I place an order in the Purina for Professionals program? The process is quick and simple. Just log into your P4P account, select the products you wish to purchase, and complete the checkout process. How do I create an order that automatically reorders? When adding a product to your shopping cart, choose the desired quantity of the product you want delivered and select a delivery frequency of one, two or three months, then complete the checkout process. How many times can I order in a month? Each month you can purchase up to four Pro Plan® food items and two boxes of FortiFlora ® probiotic supplements. Your order will be delivered to your home address by UPS in 3-4 business days. How do I purchase FortiFlora? FortiFlora® probiotic supplement is part of the Purina Veterinary Diets® line of products and requires a prescription for purchase. Your monthly order allows you to purchase up to two boxes of canine or feline FortiFlora®. Does Purina guarantee the quality of the products I order? Yes, our products are backed by a 100% satisfaction guarantee. If you are not completely satisfied with any part of your order, we will replace the product or refund your purchase price within 90 days of date on receipt. How do I place an order if I’m not near a computer? The Purina for Professionals online store can be accessed from any device with an internet connection, including tablets and smartphones. Please contact one of our customer service representatives, or call 1-888-777-1762. If you have lost or forgotten your password, please use our password reset tool. If you have lost or forgotten your username, please contact customer service, or call 1-888-777-1762. How do I change the contact information or shipping information on my account? To update your contact information, shipping information and other account preferences, please visit your account page. How do I move my existing P4P account to a different clinic's roster? Please contact customer service. 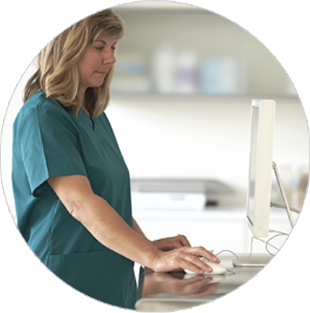 Include your current clinic’s name and zip code in your message. I’m a veterinarian and need more information on feeding and indications for a Purina Veterinary Diet. Whom should I contact? Please call the Purina Veterinary Resource Center at 1-800-222-VETS (8387) weekdays, 8 a.m. to 4:30 p.m. (CT) or consult the Purina Veterinary Diets Product Guide. Why is the Purina formula I currently feed my pet not available through Purina for Professionals? P4P features products exclusively from the Purina Veterinary Diets® and FortiFlora® probiotic supplement product lines, as well as select Purina® Pro Plan® formulas. What is the Purina carbon neutral shipping program? Purina® works with UPS® to bring environmentally responsible shipping to Purina for Professionals™ and veterinary clinic orders delivered by UPS®. UPS® provides shipping services, then purchases and retires carbon offsets from carbon sequestration or carbon mitigation projects on our behalf, effectively creating a carbon neutral shipping supply chain. UPS’s Carbon Emissions Calculator and methodology are verified by SGS Environmental Services Inc., the world’s leading carbon verification and certification company, and also certified by the CarbonNeutral Company. All Purina for Professionals™ shipments are part of the UPS® carbon neutral program. You can support this initiative by simply placing your order through Purina for Professionals™. Why is Purina® concerned about sustainability? We're passionate about pets and the people who love them, and we believe that the essence of sustainability is learning to live within the boundaries of nature. That’s why we’re continuously working to use the earth's resources more efficiently and to further improve our impact on the environment..
Do Purina’s® sustainability efforts extend beyond shipping? We are committed to continuously improving the environmental performance of our operations and our products so that they will be better for the environment throughout their life cycle. We look across our company for ways to increase efficiency, reduce waste and conserve resources. To learn more, visit https://www.purina.com/meet-purina/sustainability.